Allen’s reference to the 2017 club ties directly into the team’s expectations entering 2019: qualify for the Big Ten tournament en route to a NCAA tournament bid. Though 2018 was an off year, the club flashed down the stretch in 2017, making a run to the Big Ten Tournament final, after a 6-18 start, and falling one game shy of a NCAA berth. This year, Allen expects the Wildcats to find a similar groove, but from the start season – a level of consistent play that’ll hopefully warrant the team’s first NCAA tournament appearance since 1957. The Wildcats have 20 returning players from 2018, which gives this team a well of depth and experience that should help NU play more consistently on a regular basis. Of the 20, seven are either returning starters or heavily contributed a season ago – including a starting pitching staff that is completely intact from the year prior. The anticipation of consistency and the level of experience the club brings back is expected to translate into wins according to Allen and will have a positive impact on the growth and development of a strong freshman class. Northwestern is confident that 2019 will be the start of something new: a change of culture, a change of outcome, and the establishment of a household name. 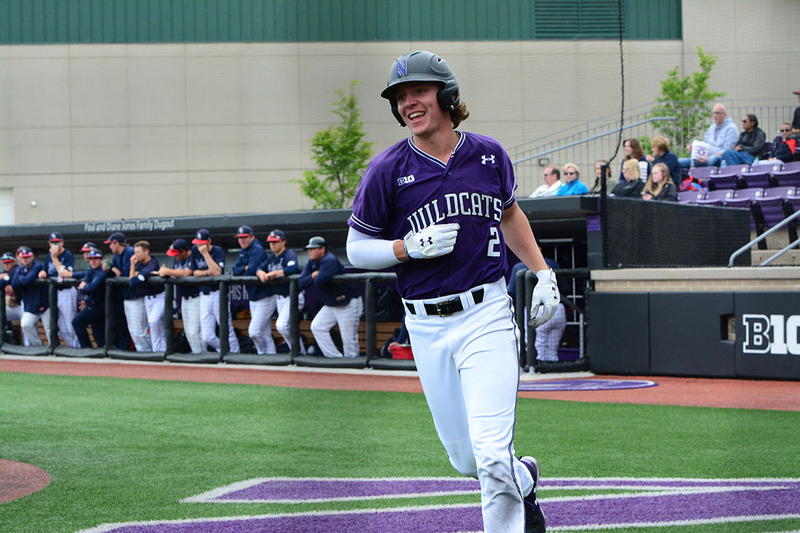 Here’s a deeper look into 2019 Northwestern baseball. Second baseman Alex Erro tags a Belmont runner out, as the runner attempts to steal second base in a late May game in 2018 vs. Belmont University. Photo Courtesy of Carolyn Katz Photography. When talking about the strengths of this Northwestern team, their depth of experience has already been mentioned. However, without a doubt, this is the Wildcats’ greatest strength, because it is connected to so many areas where the team performs well. Among these, you can expect this team to defend, and at a high level – especially up the middle of the field. The experience throughout the diamond, should give the NU pitching staff greater confidence in the defense being played behind them, a comfort all pitchers hope to have. In mention of the pitching staff, Allen raved about the “number of options” he has. Allen and his coaching staff have yet to designate a No. 1 starter, as they are blessed with the challenge of too many options. However, the likes of junior Hank Christie (RHP), the sophomore left-handed duo of Jack Pagliarini and Quinn Lavelle, and freshman newcomer Michael Doherty (RHP) are expected to be in the mix — all of who are expected to make up the Wildcats starting rotation. Though the strength of the team is expected to be their ability to defend at a high level, Allen made it clear that his club has the potential to burst on the offensive end as well. This is where the Wildcats experience comes into play regarding some of the things they could excel in, in 2019. Offensively, this team has seen a great number of college at-bats prior to the 2019 campaign, which could translate into an increased level of production. According to Allen, the team has about six players that have seen 200-plus college at-bats. This speaks comfort and savvy in the batter’s box, which could become an advantage for the ‘Cats down the road. Jack Dunn runs off the field after scoring a run in a loss 7-5 to Belmont in 2018. Photo Courtesy of Carolyn Katz Photography. A 2018 All-Big Ten honoree, the senior shortstop is expected to have an even bigger year than 2018 where he led the team in batting average, stolen bases (21), and on base percentage (OBP). Dunn is a senior leader on this team whose work ethic and grit has had a big-time impact on the culture of the club, according to Allen. Expect Dunn to have another big year and become a repeat All-Big Ten team member. As Dunn’s running mate up the middle of the diamond, Erro started every game at second a year ago and has been a solid contributor to the NU lineup since his freshman year. According to the coaching staff, Erro has a lot of good baseball ahead of him and his game really grew over the summer and through the fall. Bourbon started every game at first base a year ago and has the potential to put up serious power numbers in 2019. A season ago, Bourbon finished second on the team in every major power category (6 HR, 34 RBI, .455 SLG). According to Allen, Christie seems “motivated” coming into 2019 and Allen is hopeful Christie will return to an elite form. Christie was an All-freshman honoree in the Big Ten in 2017, but in 2018 Christie failed to build upon his freshman statically speaking. However, expect Christie to have a clear plan when he takes the mound each day in 2019, which Allen hopes will translate to a heightened level of execution and success. Left-handed pitcher Sam Lawrence delivering a pitching in middle inning relief in a 13-4 win over Belmont University. Photo Courtesy of Carolyn Katz Photography. Brother of shortstop Jack, David Dunn is expected to start in centerfield for the Wildcats this season. Dunn played 10 games a year ago but missed the rest of the season due to injury. However, early success prior to the injury a year ago has the Northwestern coaching staff excited to see what he will contribute this year at 100 percent. Allen said he expects a lot out of this pitching duo coming out of the pen. 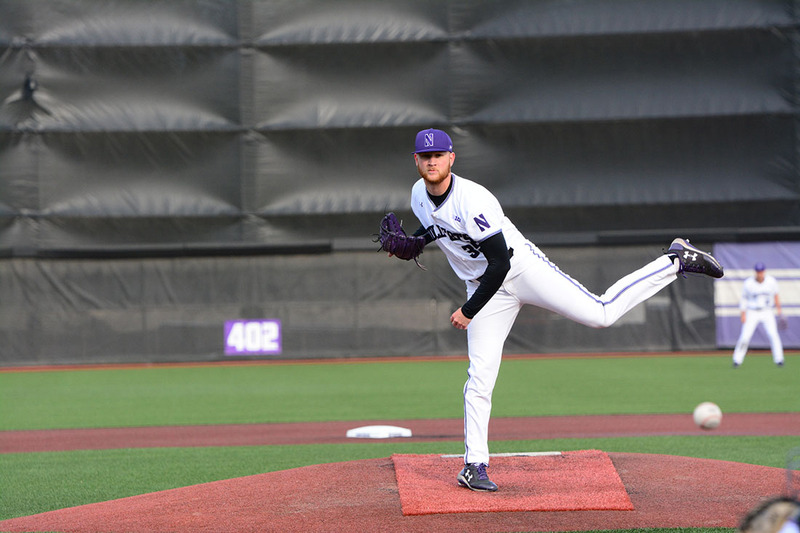 Lawrence’s freshman year really impressed the Northwestern staff, as the lefty posted a 2.85 ERA and a 5-3 record in 23 appearances, but a sophomore slump a year ago leaves room for redemption. As for Paciorek, he is a converted catcher that Allen hopes to deepen his options coming out of the bullpen. Expect these two to stabilize the NU bullpen and to be used heavily in “high leverage” situations. Described by Allen as the “prototypical…big bodied” starting pitching, Doherty – as mentioned previously – is expected to see some time in the starting rotation this year after impressing the staff in the fall with a beyond his years type of composure. Described by Allen as another “big bodied” physical specimen, Anderson flashed bright spots in the fall, and rounds out this talented group of guys. Finishing second to last in the conference a season ago, doesn’t bode well for Northwestern’s projected preseason ranking going into 2019. “My guess is they probably pick us on the back-half,” said Allen, but wherever they fall won’t make a dent in the confidence of this program. The Wildcats believe change is due and soon to come. They believe they will be a top 8 team in the Big Ten and that an NCAA tournament bid is possible. They understand that signature wins and victories on the road are necessary to boost their RPI and liken their chances at a berth. Northwestern believes in now.